You are here: Home / Indigo Crystal Rainbow and Star Children / 10 Signs of Lightworkers. Are You a Lightworker? First, Lightworkers are those who work toward enlightenment for the entire world and the planet. Second, Lightworkers ease suffering and bring higher truths. Lastly, Lightworkers begin to awaken to the Oneness/Peace/Unity within themselves. Furthermore, some know they consciously hold a frequency of Light for the highest good of humanity and the Earth. We all have the ability to share our inner light; to help in physical or spiritual ways. Lightworkers appear in all forms and all walks of life. In conclusion, we make other’s lives better and brighter. We all have the ability to share our inner light through a smile or giving encouragement to a friend. Likewise, we can assist a stranger or noticing a homeless person ask them what they most need. In conclusion, Lightworkers can be an ordinary person or child. A child sees a homeless man on a bench outside a restaurant. As a result of sensing his hunger, the child goes out and consequently, gives her meal to him. 1. First of all, we believe as one human family we are all connected. In addition, all life such as minerals, plants, and animals in nature share this connection/oneness. 2. Second of all, we believe in the creative ability of the human spirit to heal ourselves and others. 3. Third of all, we believe we are in a rapid state of evolution unmatched in human history. In fact, this will result in greater empowerment for the highest good of all humanity. 4. Fourth of all, we believe Love as the highest expression of our spirit. 5. Fifth of all, we believe Love to connect all our hearts as One Matrix of Love. To state it in another way, love communicates beyond words. 6. Sixth of all, we believe taking personal responsibility within for our emotions and thoughts. As a result, this empowers both ourselves as well as others. 7. Seventh of all, we believe in embodying and experiencing our Life’s Passion and Joy. As a consequence, we serve as a model for others. 8. Eighth of all, we believe in angels, archangels and all orders of Divine Light Beings. 9. Ninth of all, we believe all humans have the opportunity to choose to evolve into higher states of consciousness. 10. Most of All, I believe in mentoring, nurturing and teaching the New Children. Who are the Future Lightworkers? 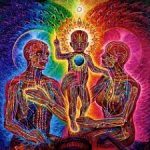 Finally, the Crystals, Rainbow and Sun children or Star Seeds, the Lightworkers of the Future, carry the seeds in their DNA of the new consciousness. Eventually, these New Children will create the New Heavens and the New Earth.